f you want serious comedy David Tsonos is not your man. His comedy stems from being the youngest of five boys, babysitting ...his nephews and his cat. 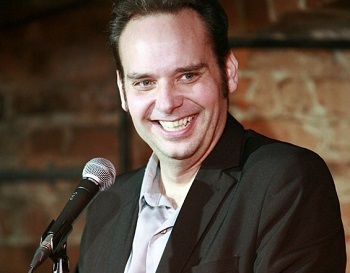 Whether it’s a Bar gig, a Comedy Club or a Corporate function David makes them laugh until they can laugh no more. (Well maybe a little more.) Starting off in Canada in 1999 and now making London UK his home he has performed in over 15 countries. He has appeared at numerous fringe festivals in the UK including Edinburgh, Glasgow, Bath and Hastings. He will continue to make people laugh until Aliens with no sense of humour take over Earth. Yazz Fetto is a comedian, comedy writer and director. He has written comedy material for BBC Radio 4s ‘Dead Ringers’. He also has sitcoms in development for BBC Radio, BBC TV and Sky. He was a producer on the cult hit comedy horror film ‘Freak Out’ which was released on DVD in the UK and USA. He has directed many online videos as well as a pilot for Sky Digital. Yazz has performed stand-up in clubs throughout the country including The Roundhouse, The Tabernacle, Courtyard Theatre, Leicester Square Theatre and Up The Creek, amongst many others. ‘I let the dogs out.